On a sunny day in Haiti, Lelani Williams, M.B.A./M.A. (CDP) ’16, started crafting a recipe. She wanted to feed people devastated by natural disasters, but, more importantly, help them feed themselves more easily in the future. Her recipe didn’t use traditional ingredients. It consisted of equal parts hard work, inspiration and business skill, along with a big helping of heart. The delicacy she wanted to cook? Rice. Or chicken. Or anything, really — as long as it could be made in the solar-powered cooker that her professor, Jude Fernando, had shown her during that May 2015 trip as they were conducting field work with other Clark University students. 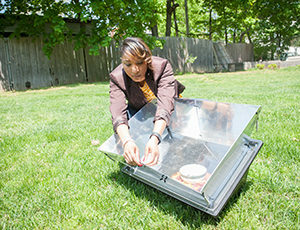 Lelani thought about that solar cooker while she was on the Caribbean island left devastated by a 7.0-magnitude earthquake in January 2010 and Hurricane Sandy in October 2012. And she kept thinking about it at home in Rhode Island and back at Clark. Finally, she had a name for her recipe, Sun Top Solar Cookers, and an idea for a business model that she hopes women in developing countries will easily be able to follow. Her idea started to simmer when she interviewed farmers and learned about major challenges — poverty, unemployment, social and gender inequality, and environmental issues, to name a few — facing the country and its people. It reached a boil when she heard from women, who in Haitian culture are responsible for locating fuel sources and cooking with what they find. Scarce availability of electricity — Lelani says only 25 percent of the country has access to intermittent electricity — led the women to use wood and charcoal, which itself is becoming scarce (she cites a figure that 98 percent of the country is deforested). Despite its hot, sunny climate, solar power isn’t widely used in Haiti, according to Fernando. “A lot of the women said they enjoyed farming, but wanted to learn a different skill and be empowered,” Lelani says. Soon after that, she began gathering what she’d need to get Sun Top off the ground. 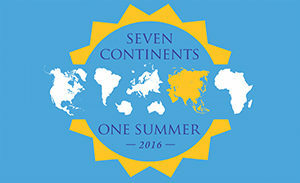 When she returned from the trip, she started working on her thesis and ended up writing Sun Top’s business plan. “My husband told me to research this as if I was actually going to do it as a business,” she says. Lelani’s goal of helping people and being a social entrepreneur began long before she set foot in Haiti. She earned an associate’s degree in criminal justice and graduated from Bryant University with a bachelor’s degree in business with a focus on marketing and psychology. She’s married to the Rev. Dr. Jeffery A. Williams, pastor of The King’s Cathedral, a non-denominational congregation in Providence, R.I. in which she’s also involved, whose mission centers on empowering people to change the world. In addition, she’s taken mission trips to countries like Kenya, Zimbabwe and Zambia where she taught women how to start businesses. “The desire to help women was always there, but I didn’t know how until my capstone evolved,” she says, noting that she’s heard the women she taught in Zambia are implementing what they learned in her class in their own businesses. “It’s exciting to know that they’re still building themselves after I left,” she says. That experience helped Lelani decide to go to graduate school and figure out how to use a master’s degree to help others empower themselves. However, she wanted the right program. Clark’s dual degree program, which she calls “the perfect fit,” has helped do just that. Right now, Lelani has a plan and partnerships in place to sell the “set it and forget it” product made in the United States out of recycled plastic. She notes it’s large enough for two pots and a cook can make curry chicken with it in about two hours — much less time than it would take someone to gather the fuel, prepare the meal and cook it over an open flame. 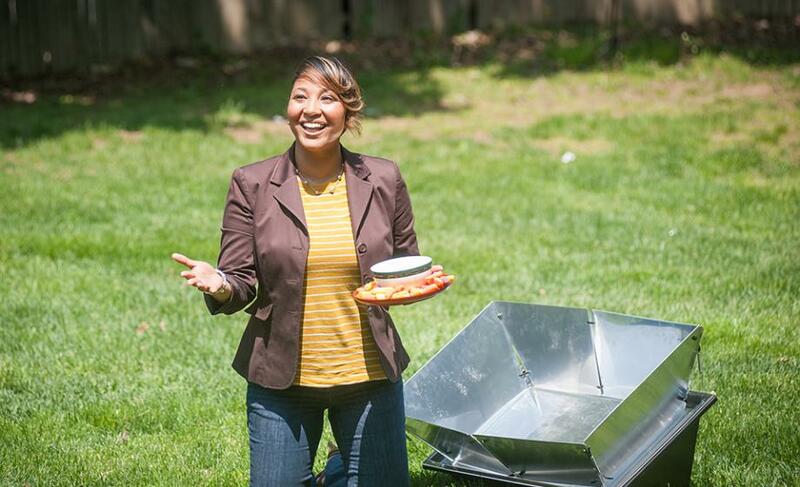 She’s working with Solavore, a woman-owned solar cooker business, to produce the units she’ll sell in Haiti; FONHDAD (Haitian Foundation for Sustainable Development), a nonprofit located in Haiti; and Clark’s field schools in the country. She notes it isn’t a total replacement for charcoal — not every day is sunny — and that she’s been having conversations about bundling the solar cooker with clean charcoal from a Haitian producer for those instances. And she won $1,250 for Sun Top in Clark’s Ureka Big Idea Challenge earlier this year, a springboard for students’ entrepreneurial ideas, many of which are geared toward making a positive impact in greater society. As a social entrepreneur, she understands there’s a way to balance the business aspect with social change and helping the community. She initially plans to sell the solar cookers for $120 and work with microlenders there to set up affordability programs for women.